How we work changes and grows with new discoveries and technology, but we embrace a legacy that never goes out of style. In 1955, John Meyer founded a firm of consulting structural engineers in Minneapolis, Minnesota. 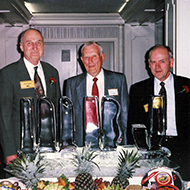 Rollie Johnson and Jack Borgman joined John in the late 1950’s, and by 1967, Meyer Borgman Johnson had been established as a group of engineers strongly committed to providing the highest level of structural engineering services. The firm carries on that legacy today. Just as important is the founding partners’ legacy of valuing employees and clients, based on respect, honesty, and hard work. With low employee turnover and a high percentage of repeat clients, we are able to build lasting partnerships that span decades. Over the years, we have expanded our capabilities and our offices, embraced new, ever-changing technology, and looked at old challenges in new ways. Today, our firm and its leaders are still committed to the values of partnership, integrity, creative solutions, and exceptional service.